#AmazingOwls [VIDEO] ~ The Amazing Race Australia… Owl Style! Can Michael and Vicky win the #AmazingOwls? The following #AmazingOwls video was inspired by a visit by popular TV race/show, The Amazing Race. 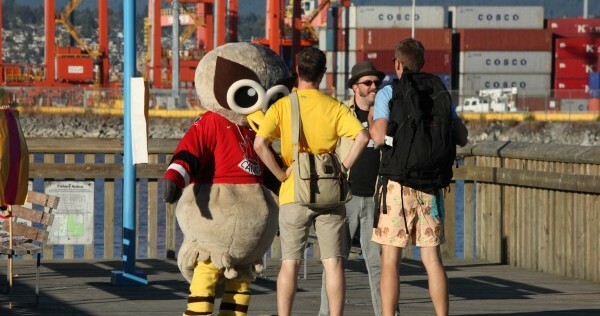 The Australia edition paid a recent visit to Vancouver, BC, including a stage finish at Crab Park near the HootSuite office. We enjoyed it so much that we decided to recreate the big finish with a special HootSuite version – complete with prizes. Who will win? Watch to find out. ‘Twas a beautiful afternoon in Vancouver with sunny skies and a light sea breeze when five teams arrived, prepared for adventure and fierce competition. Little did they know, the race of their lives was about to begin. The events were excruciating, testing the five brave teams and sending them on an epic journey of self-discovery all over Vancouver –from the peaks of Grouse Mountain to the famous totem poles in Stanley Park – before a sprint finish near the secret beaches of a downtown neighbourhood. Thrill seekers, Destin and Connor, are world travellers, fitness enthusiasts and evidently, college dropouts. These Sydneysiders run their city’s first ever pop-up yoga shop as well as a lucrative string of dingo walking operations. Jake and Josh spend their days reading various leather bound books in coffee shops throughout Perth. Intellects by trade, they’re using #AmazingOwls as a chance to push personal boundaries in the quest for self-actualization and relationship building. Ted and Darrel entered #AmazingOwls due to losing a bet at their firehall in Hobart. Not knowing the stakes of their wager at the time, suffice it to say they are not as excited as the other teams in Vancouver. Currently trying to patch things up, Alex and Marianne never see eye to eye. Alex’s competitive fire is contrasted by Marianne’s preference for scenery and good conversation. #AmazingOwls marks a last ditch effort to save their relationship. Michael and Vicky embody what #AmazingOwls is all about. Michael’s experience in the intricacies of kung fu combined with Vicky’s professional speed-walking background made them an early favorite to win it all. A hallmark event by all accounts – #AmazingOwls marked a historic display of internal struggle, personal fulfillment and relationship building all in the name of competing for the title of The Amazing Owl! On Thursday October 25, join HootSuite Australian Ambassador, Ben Teoh at Hotel Tivoli at 6:30 PM (UTC+10:30). At this 2nd HootUp in Adelaide, expect a dazzling display of HootSuite’s features whilst enjoying drinks and appys. Get more details and RSVP for #HootUpAdelaide on Facebook. Join HootSuite Enterprise Owl, Jet Gray at the PPR Boardroom on November 1 at 6:30 PM (UTC+10) for casual drinks and networking. Grab some HootSwag for the road, share tips and make a new friend or two. Hoots to Social Sydney for hosting – more details on the #HootUpSydney Meetup page. Head to The Lost Dogs’ Home on November 20 at 6:30 PM (UTC+11) for two presentations about HootSuite social media strategy. Pizza and beverages are on us, your gracious hosts Chris and Nik can’t wait to share valuable intel, and we can’t wait to see the snapshots. More details on the #HootUpMelbourne Meetup page. Hope everyone enjoyed our treats to all the Owls downunder. Please lend a helping hand with a comment about how we can help your social media projects and/or Tweet us @HootSuite_AUS or @HootClub. You may end up with a #HootKit for your opinion. Stay tuned for more Australian tailored messages from your friends at HootSuite, including Look Hoo’s Hooting Australia.